All experience levels are welcomed with Light Tackle and Fly Fishing Guide Captain Gregg Mckee. 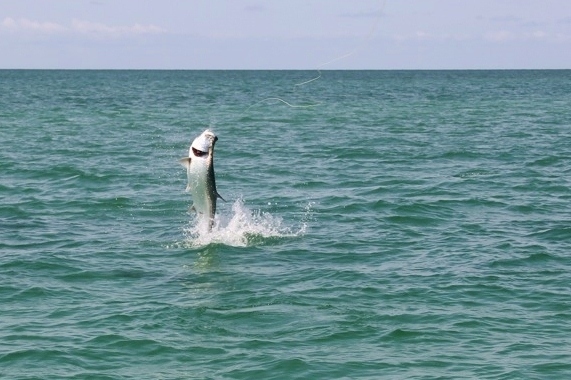 Tarpon are the ultimate light tackle challenge, and the waters around Pine Island are home to some of the largest examples of these spectacular gamefish found anywhere in Florida. Starting in the early spring, the first migrating schools of silver kings make their appearance off the Gulf beaches from Sanibel to Boca Grande. Triple digit tarpon are a common sight in our waters from April through July when Pine Island becomes Ground Zero for the big game fly rod anglers. Later in the summer and through October, juvenile tarpon are a common sight on the flats just minutes from my dock. No matter how you want to chase them, Pine Island will give you more shots at tarpon than almost anywhere else in Florida. Redfish are saltwater's most popular inshore species and Pine Island has an abundance of them year round. With some of the best grass flats anywhere in Florida, our population of legal sized reds has never been better. Fly fishermen will find some of the best tailing conditions anywhere during the fall and winter when our redfish school up by the dozens in both Pine Island Sound and Matlacha Pass. Spin and conventional anglers will have a blast during the summer months when the big reds prowl the mangrove shorelines and attack top water lures and live bait. Best of all, our season never closes on this excellent tasting species. Snook are one of the most highly prized saltwater gamefish, for both their explosive fight and fantastic tasting filets. After a five year closed season following a devastating cold spell in 2010, Pine Island's snook population is back and stronger than ever. Even though they're a tricky species to land with a fly rod, more 30 inch and larger snook are caught off our local beaches than anywhere else on Florida's west coast. From the clear waters off Sanibel to the dark shorelines of upper Charlotte Harbor, landing the snook of a lifetime is possible all year in Southwest Florida.